Combine all ingredients except dough crust into slow cooker and cook on low for about 4 hours or high for 2. Pour chicken pot pie filling into four separate cocottes or ramekins. Cut puff pastry sheet into 4 pieces. 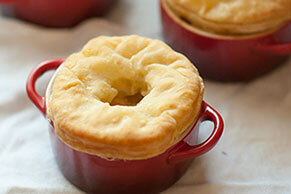 Cover each cocotte with a piece of puff sheet and pinch sides to close. Create vents with a fork. Bake on 350 for 20 minutes (or until pastry puff crusts are a golden brown).